In our blood there is... the chivalric, pleasure and art loving French; the picturesquely aggressive Scotch-Irish...; the sturdy, undying tenacity of the Anglo-Saxon; the brave, prudent, thoughtful, fore handed German; the stubborn, freedom loving, astute Dutchman; ... the canny Scot; the free handed, hot blooded, gamecock of all the races, the Irishman. Atlantic Europe was driven by a westward impulse. Native- and foreign-born immigrants spread unevenly across the midwestern plains before the Civil War. Midcontinental Illinois with its open spaces and frontier communities offered fertile soil, cheap land, jobs, and freedom. Personal letters and return visits of relatives and friends molded social networks linking European homelands and American destinations. Influenced by social networks, emigrants formed notions or created mental maps of where to settle. All of these things were critical in establishing the migration patterns that emerged within the general fever for settling in America. In western and northern Europe during the 1840s, Illinois was a popular destination for those with "American fever." The land is rich natural meadow, bounded by timbered land, within reach of two navigable rivers, and may be rendered immediately productive at a small expense. The successful cultivation of several prairies has awakened the attention of the public, and the value of this description of land is now known; so that the smaller portions, which are surrounded by timber, will probably be settled so rapidly as to absorb, in a few months, all that is to be obtained at the government rate, of two dollars per acre... The Big Wabash, a noble stream, forming its eastern boundary, runs a course of about four hundred miles, through one of the most fertile portions of this most fertile region. Morris Birkbeck, Letters from Illinois (1818), pp. 123-124. Birkbeck also contrasted the cheap fertile land of Illinois with the worn-out soils in England that required twice as much capital for cultivation. dominated the northeastern United States. 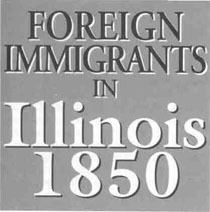 Illinois by 1850 was occupied by 736,931 native-born immigrants (86.6%) and 110,593 foreign-born immigrants (13.0%), with the remainder from unknown birthplaces. But an analysis of the origins of 196,896 adult males included in that 1850 count creates a different picture. Native-born adult males principally from the states due east and southeast of Illinois accounted for 77.5% of the total. Foreign-born adult males, 22.5% of the total, were from western and northern Europe. A higher proportion of adult males were foreign born (40.1%) rather than native born (20.7%), and many were young adults or husbands who preceded their families to new homes. Identifying the birthplace of foreigners is the first step in creating a map that illustrates the areas outside the United States (Figure 1) from which people migrated. These larger areas are migration fields. A few countries were excluded from the maps presented here because the number of people traced was too small. Foreign immigrant groups were ranked in each county from the largest number to the smallest. With few exceptions, the counties with primary concentrations of foreigners included distinctive blends of Germans, Irish, and English immigrants ranked first, second, or third. Even the counties with smaller numbers of foreigners epitomized this ethnic mixing. In three anomalous counties (Iroquois, Henry, and Stark), a smaller foreign group lopsidedly outnumbered the dominant European elements. The blend counties formed three subtypes. Either Germans, Irish, or English dominated. In each case the largest foreign group was at least 50% greater than the second largest group, and often two or three times larger. Destinations favored by foreign immigrants reveal mappable patterns (Figure 2). Foreign immigrant groups were generally smaller in population size than native-born groups and tended to form segregated clusters in a few townships or counties. To analyze the foreign immigrant regions for 1850, I mapped the number of foreign-born adult males in each Illinois county. County concentrations—"core," "domain," "sphere," and "avoidance"—confirm the immigrants' migration patterns, which can be interpreted as "cores" versus "peripheries." More than 1,000 foreign-born adult males in a county identifies a core concentration. Two-thirds of the core counties had more than 1,500 foreign adult males. Domain concentrations ranged from 375 to 1,000 foreign adult males and generally mark the lateral spread of immigrants from core areas into contiguous counties. Sphere concentrations—65 to 374 foreign adult males—represent average immigrant dispersion. Avoidance concentrations, less than 64 foreign adult males, delineate minimal settlement interest and peripheral locations. included a significant infilling of smaller foreign groups from Canada (Quebec), Scotland, France, and Norway. 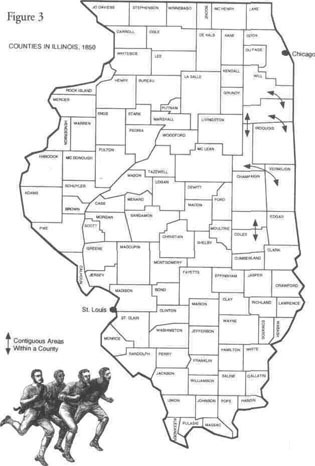 Distant northwest Illinois was unmistakably a foreign mixing area, except for three anomalies: Germans prevailed in Stephenson County where German-speaking Pennsylvanians had located in disproportionate numbers (Figure 3), English congregated at Whiteside County, and because of a colonization scheme at Bishop Hill and a settlement ripple effect, and Swedes predominated in Henry County. A sizable influx of Scotch, Canadians, and Swedes also settled in northwestern Illinois. Midstate Illinois had sharply contrasting foreign migration field patterns (Figure 1). East-central Illinois, with extensive prairie habitats and interior inaccessibility to agricultural marketplaces, was a hollow frontier area (a bypassed area), with sparse numbers of foreign- and native-born immigrants. Two counties—McLean and Vermilion— included almost 40% of the foreign-born adult males in east-central Illinois. McLean was a blended county, and Vermilion was dominated by English immigrants. A scattering of Canadians and Scotch filtered into the Grand Prairie. The foreign-born migration fields in west-central Illinois were dissimilar in their composition. In the Military Tract (a portion of western Illinois reserved for War of 1812 veterans), blended migration patterns formed a large contiguous block in the northern half. Stark County, with a relatively small foreign population, was anomalously dominated by Scotch immigrants. Irish immigrants dominated three scattered counties. Three Mississippi Valley counties— (Hancock, Adams, and Calhoun)— experienced a disproportionate infilling of Germans. Swedes, Scotch, Canadians, and French settled in small numbers in the northern half of the Military Tract. The tract's southern half was settled by Canadian and Scotch immigrants. The Sangamon River country was marked by a sequencing of different blend combinations. A German enclave developed in the middle Illinois Valley. English dominated the lower Illinois Valley, though there was one predominately Irish county. Inland counties were typical mixtures of primary foreign elements. 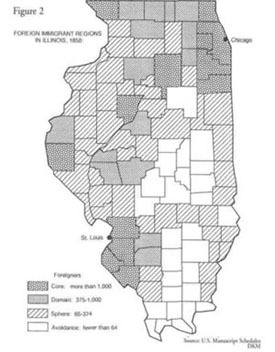 Sangamon County also infilled with immigrants from France, Scotland, Canada, and Portugal. Portuguese immigrants settled in adjacent Morgan and Sangamon counties. (Table 1). In southern Illinois, foreign migration field patterns reveal some subtle differences. Where Germans predominated, they were disproportionate, usually three to four times larger than the second largest foreign group. The German migration cluster in southwest Illinois marked a salient midcontinental German enclave (Figures 1 and 3). German-speaking Swiss colonized the Highland area of Madison County. French persisted in the remnant French colonial district in the American Bottom. Smaller numbers of Scotch and Canadians settled southwest Illinois. Eastward, astride the National Road, there were small numbers of Germans, with the largest concentration at Teutopolis in Effingham County. A German-speaking French colony at St. Marie in Jasper County represented an anomaly of Alsatian immigrants. English and Irish immigrants dominated counties on opposite sides of extreme southern Illinois. To the east was the remnant English colony near Albion in Edwards County. Irish farmers to the west contrasted with Irish laborers in the small gateway village of Shawneetown in Gallatin County at the Ohio-Wabash confluence. Small numbers of Scots and Canadians settled southern Illinois. Europeans did not assume significant proportions in Illinois until the 1830s and 1840s. In 1850, 81.1% of Illinois' foreign born adult males came from three countries, Germany, (35.9%), Ireland (27.3%), and England, (17.9%) (Table 1). Europeans tended to segregate within a region because they filled in areas previously settled or bypassed by American pioneers. If the ethnic enclave grew substantially beyond a particular township, foreigners spilled over into bordering townships or even into bordering counties. Fragmented clusters of Europeans were interwoven among predominately Upland South, New England, and Midland-Midwest immigrants. 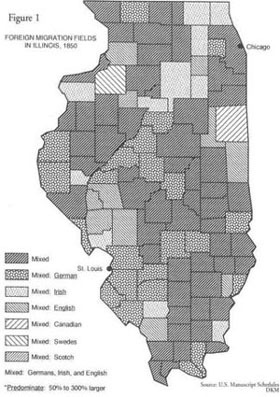 By mid-nineteenth century such segmented European immigrant patterns concentrated in southwestern, west-central, northwestern, and northeastern Illinois (Figure 2). St. Louis and Chicago, both on navigable waterways, emerged as key interior gateways for Europeans dispersing across Illinois. Expanding regional urban-road networks in the 1840s increasingly converged on and diverged from those dynamic gateways (Figure 4). A three-tier urban hierarchy emerged in Illinois. The urban system comprised regional, subregional, and lower level nodes. The three distinctive urban centers in the urban-road network were characterized by increasing population size, connectivity levels, and hinterland areas. Regional, sub-regional, and lower level nodes and their hinterlands developed as attractive immigrant destinations. Germans, Irish, English, Canadians, Scotch, and French revealed a preference for regional and subregional nodes and their tributary areas. Immigrant groups of lesser numbers such as the Norwegians, Swiss, Swedes, and Welsh formed distinct ethnic enclaves or small colonies near accessible commercial corridors or in peripheral frontier location. 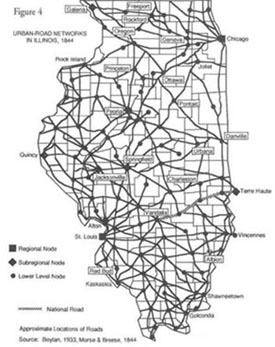 hinterlands of regional nodes (St. Louis and Chicago), subregional nodes (Galena, Peoria, Quincy, Jacksonville, Springfield, and Alton), and lower level nodes (county seats, market centers, and river and canal towns) were attractive destinations for marketplace-oriented farmers (Figures 2-4). Some foreigners, such as the Irish, favored major urban centers where the need for unskilled laborers prevailed. Other Europeans with skilled labor backgrounds also selected the larger towns and cities. The lead-mining district in northwest Illinois attracted a diverse group of foreigners who satisfied the unskilled and skilled labor needs of an extractive industry and a subregional urban center. Cook County, in northeast Illinois, emerged as the epicenter of an expanding foreign immigrant core with 17.8% of all foreign-born adult males in Illinois (Figures 2-3). A disproportionate number of foreigners in Cook County (73.1%) settled in the lake port and canal town of Chicago. Both Chicago and Cook County were diverse "foreign countries" with foreigners comprising 64.2% and 62.7% respectively of the total adult male population. Will County, whose settlement and economic potential were enhanced by the Illinois and Michigan (I&M) Canal, was also attractive to foreigners. Foreigners were very visible in the populations of the core counties of Lake (38%), DuPage (42.5%), and Will (40.5%). LaSalle County, at the juncture of steam navigation and the inland terminus of the I & M Canal, was a magnet for immigrants. LaSalle County supported a high proportion of foreigners, 41.3%. Northern tier domain counties (those of 375 to 1,000 foreign adult males) near the Chicago-Galena Road (Figures 2-4) were attractive destinations for European settlers. Some smaller cities and towns, not only large midwestern cities like Chicago, Milwaukee, and St. Louis, were dominated by foreigners. Jo Daviess County formed the core foreign cluster in northwest Illinois. The county and Galena were diverse, with 55.7% foreign immigrants countywide and 62.0% in Galena. Because of outlying lead mines, dispersed farmsteads, and tiny rural communities, only 39.6% of the foreigners resided in Galena, in contrast to 73.1% in Chicago. mixture in Peoria County compared with the northeast Illinois where Irish predominated; Adams County paralleled German-dominated southwest Illinois. In Sangamon River country east of the Illinois River Valley, three domain counties formed a prominent foreign cluster that included Cass County with Beardstown, Morgan County with Jacksonville, and Sangamon County with the state capital of Springfield (Figures 2-4). Cass County had a larger proportion (31.1%) of foreigners than Sangamon (18.1%) and Morgan (12.7%) counties. Foreigners were attracted to Beardstown (the "hog butcher of Illinois") and Springfield, with 46.0% and 58.0% respectively of their county totals. One-fourth of the foreigners in Morgan County resided in the county seat and market center of Jacksonville. A distinctive European social fabric including belief systems, sense of community, and economic practices emerged in Springfield and Jacksonville, with 28.8% and 26.6% foreigners respectively. Beardstown was also like a foreign country with 52.4% foreigners; 68.3% of the foreigners were German. The second largest foreign immigrant core spread eastward from the middle Mississippi Valley mercantile linchpin (Figures 2 and 4). This foreign enclave forged a contiguous block of core counties straddling the regional road network that converged on St. Louis and Alton. Southwestern Illinois revealed a mixture of Irish and English, and a disproportionate number of Germans. French and Swiss also settled in those counties. Foreigners settled on dispersed farmsteads and in tiny rural communities. Belleville and Alton attracted only 16.9% and 23.8% of their county's foreigners. The courthouse and market center of Belleville had a higher proportion of foreigners, 70.4%, than did Chicago. But Belleville was like a German city, with 90% of the foreigners German. Alton had almost equal proportions of foreign- and native-born immigrants. Its foreign element was equally diverse, with about one-third each Irish and Germans and one-fifth English. Foreigners were highly visible in the core counties of Monroe (58.9%), St. Clair (57.1%), Madison (39%), and Randolph 37.1% (Figure 2). Monroe and St. Clair counties joined Cook and JoDaviess counties in northern Illinois as "foreign countries." The four core counties of southwest Illinois were a transplanted Germania. Germans were 73.3%, 78.5%, 46.9%, and 51.6% respectively of the total foreigners. The inland tier of domain counties, Clinton and Washington, which abutted St. Clair County, had substantial proportions of foreigners, 32.9% and 27.4% respectively. Germans dominated both counties, 80.6% and 68.3% respectively. German settlers moved eastward from the Belleville area cultural hearth. In northern and west-central Illinois, the segmented core counties (more than 1,000 foreigners) and domain counties (375 to 1,000 foreigners) were linked by adjacent sphere counties (65 to 374 foreigners) astride the Illinois Valley and Mississippi Valley corridors (Figure 2). Small numbers of foreigners molded linear sphere county patterns in east-central and southern Illinois. The first sphere pattern along the National Road extended eastward from the foreign-born core area in southwest Illinois. The second sphere pattern followed the Wabash Valley Corridor in eastern Illinois northward from the Ohio River to the Illinois and Michigan Canal. A few isolated foreign colonies were established in southern Illinois. The largest foreign cluster persisted in Edwards County, where the remnant English Colony continued to attract English immigrants. The English comprised 80.6% of the foreigners in this sphere county. In this area settled predominately by native-born Americans—Upland Southerners to be precise—foreigners were 39.1% of the county's adult males. Germans were a disproportionate 95.3% of Effingham County's foreigners, with most concentrated near the National Road. Foreigners were 30% of the population of this Upland South dominated county. making inexpensive government lands less available. In east-central Illinois the sparse road network significantly constrained a large influx of settlers. Isolated farmers and rural communities between the Wabash-lllinois commercial waterways were distant from steamboat river towns and regional, national, and world markets. Farmers favoring commercial sales slowly settled the Grand Prairie, even though large amounts of cheap, fertile lands were available to them. A limited regional urban hierarchy developed and connected with the riverside, subregional node of Terre Haute, Indiana (Figure 4). Without larger market centers that offered labor and business opportunities, east-central Illinois remained unacceptable to many foreigners. With the building of the Illinois Central Railroad, however, the peripheral railroad lands and railroad towns in the Grand Prairie developed as desirable marketplaces and attractive settlements for immigrants. By 1850, marketplace-oriented farmers and urban-oriented laborers, artisans, and merchants were settling Illinois. Rural ethnic enclaves that incorporated dispersed farmsteads and tiny communities as well as urban ethnic neighborhoods in the cities and towns provided the essential settings around which ethnic groups clustered. Foreigners cut off from their distant mother countries and native cultures sought comfort and familiarity in the compact and scattered ethnic rural and urban communities. Such communities were integral to the foreigner's survival, well-being, customs, ethnicity, language, and religion. A persistent sense of community was propagated in social and cultural bonds deeply rooted in old world traditions, attitudes, and values. Shared memories and customs assured survival and adaptation of one's ethnic spirit in a new American homestead. 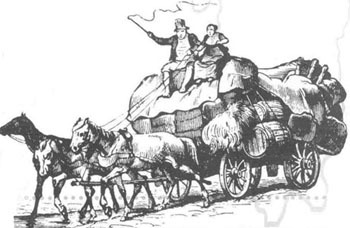 Foreign immigrants influenced and were in turn influenced by transportation. The foreign immigrant clusters with their distinctive county foreign migration field mixtures (Figures 1 and 4) were connected to the expanding regional urban-transport infrastructure. (Infrastructure includes all the means of transportation—wagon roads, trails, railroads, etc.— as well as the businesses and laborers in transportation.) Europeans' clustering, dispersing, and mixing patterns engendered the fragmented structure of the foreign immigrant region. Regional, subregional, and lower level nodes and their hinterlands were primary destinations in the growing regional urban hierarchy. In the late 1830s and 1840s, immigrant cores attest to foreigners' settlement fixations. Foreigners' segmented structure focused settlement within the spreading regional urban-road networks (Figures 2 and 4). Foreigners came in waves to Chicago and its hinterland in northeast Illinois, the northern tier counties astride the Chicago-Galena Road, west-central Illinois straddling the Illinois Valley Corridor, and to St. Louis' hinterland in contiguous southwest Illinois. By the mid-nineteenth century, Illinois was a polyglot society composed of people from many different national backgrounds. Although this article has focused on the settlement of immigrant Europeans, they comprise but one group of Illinoisans. Native-born Americans who migrated to Illinois from other states could be addressed in other articles. Illinois' present diversity as a group of rural and urban places and agricultural and industrial economies took root with those earlier European immigrants.